The camera's rolling. The lights are blasting down from all directions. You've only got one chance to get this right and prove you're the right actor for this movie. Your co-star finishes his line and all eyes turn to you. With a deep breath, you begin your performance. Gesturing with your hands, turning your head thoughtfully to the side, delivering every line with gusto, you're pretty sure you nailed it. You smile timidly, awaiting your critique. It's tough to be a movie star, but someone has to do it. Why not you? 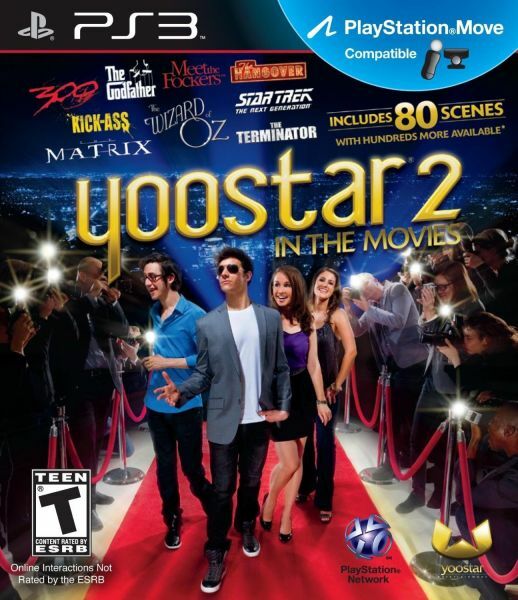 In the interactive phenomenon, Yoostar 2: In the Movies, use the Playstation Eye camera to project yourself right into your favorite movie and TV scenes. With 50 scenes to choose from, you can perform in current hits, including The Hangover, Tropic Thunder, Meet the Fockers and 300, or try your talent in modern and all-time classics, including The Godfather, Rocky, Casablanca and The Wizard of Oz. If the small-screened world of television is more your style, act out scenes from popular TV shows, including Star Trek, Mad Men, and CSI. Your performance is scored on accuracy and overall performance, allowing for improvisation that draws on your creativity. A variety of modes offer single- and two-player challenges that you can share with friends and the Yoostar 2 community as you try to prove you've got the stuff to make it in Hollywood.